What is it about New Jersey that is responsible for producing so many great singer-songwriters? Or is it the culture? Now New Jersey can be proud to add to this list another inspiring singer-songwriter with the passion, dedication and talent to become another one of the greats — Matt Colligan! Matt was recently featured on two shows on Alive with Clive, and gave an impressive performance of 8 of his songs! Drawing upon his experience with Italian music industry mogul, Umberto Labozzetta and Lab Promotion during visits to Italy, Matt combines thoughtful poetic lyrics and a smooth voice with musical influences from a wide range of famous bands and performers such as U2, Peter Gabriel, Bad English, Jason Mraz and Bon Jovi, to produce a sound that all who get to experience his music enjoy. 4. “Torn Apart,” about not letting your internal struggles affect your life. 4. “In the Distance,” about staying committed to goals and dreams. 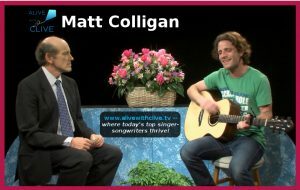 If you’ve been a fan of any of the famous performers mentioned above, you’re destined to feel a strong connection to and be inspired by Matt Colligan while you watch his two shows on Alive with Clive! And, you can see Matt Colligan LIVE at Rockwood Music Hall, Stage 1 on Sunday, December 4, at 5 p.m.